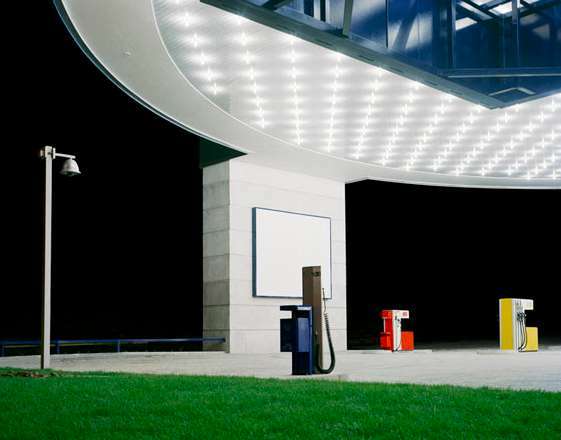 At the center of Faulhaber’s attention are the real public places in Germany, Japan and the USA: gas stations, shopping centers, cinema halls, parking lots – that which surrounds us every day. 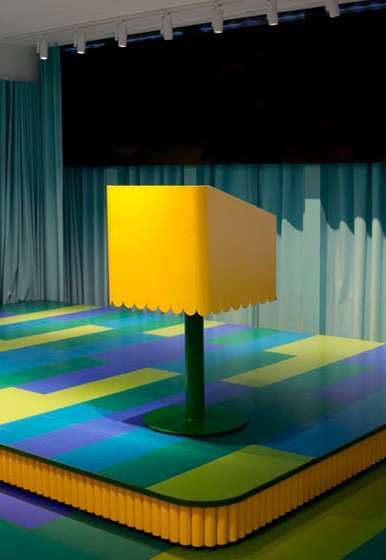 He photographs these objects at a stage when their construction is already completed, but the design has not yet been commissioned and the user has not yet broken the ideality of the newly created by his presence. PR Info _ The exposition consists of works from the project LDPE (low density polyethylene), over which Faulhaber worked for several years starting in 2003. The name itself already manifests the artificiality of the captured spaces. The synthetic material used for the production of plastic bags becomes a reference to our time, when packaging often acquires more importance than the product itself. “ It’s the lifestyle, which is determining our way of living “ the author notes. Completed and not yet used architectural spaces are so perfect that they seem to be designed on a computer. Nevertheless, the structures are fixed in their natural state. The author refuses any digital processing and does not use additional light sources. He shoots on a large-format camera, using a long exposure, so the images are extremely detailed. Space, devoid of human presence, resembles theatrical scenery, in which the action will unfold at any minute. The geometry, rhythmicity of lines, color saturation, emptiness and tightness of the photograph create a feeling of tension of composition and inner drama. The works of the author are rightly compared with the work of the most outstanding representatives of the Düsseldorf School of Photography: Thomas Demand, Andreas Gursky and Thomas Strut. A vivid phenomenon in the history of art, the class of Bernd and Hilla Becher helped form a number of distinguished authors of conceptual photography. In the works of Faulhaber the viewer finds the same interest in architecture and public space, a particular attitude to the color and rhythm of the composition, attention to elements and the maximum detail characteristic of the „Düsseldorfs“ who in the 1970s and 1980s changed the world of photography by integrating it into the context of contemporary art. The author himself admits that he was an admirer of their work while still studying Photography at the University of Applied Sciences and Arts in Dortmund.